SDN fabric controller for commodity data center switches describes how the real-time visibility and hybrid control capabilities of commodity data center switches can be used to automatically adapt the network to changing traffic patterns and optimize performance. The article identifies hybrid OpenFlow as a critical component of the solution, allowing SDN to be combined with proven distributed routing protocols (e.g. BGP, ISIS, OSPF, etc) to deliver scaleable, production ready solutions that fully leverage the capabilities of commodity hardware. This article will take the example of large flow marking that has been demonstrated using physical switches and show how Mininet can be used to emulate hybrid control of data center networks and deliver realistic results. 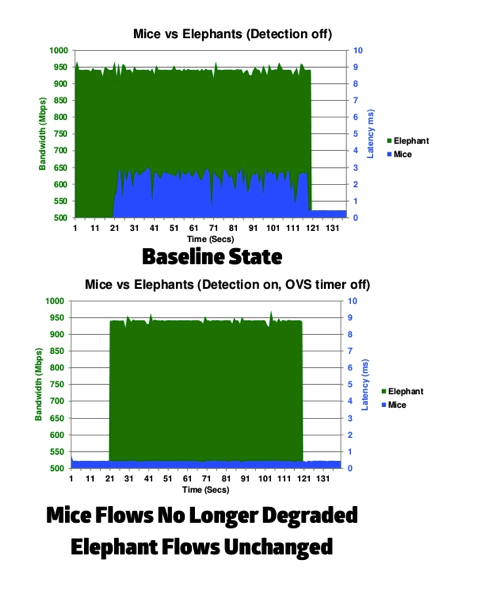 The article Elephant Detection in Virtual Switches & Mitigation in Hardware describes a demonstration by VMware and Cumulus Networks that shows how real-time detection and marking of large "Elephant" flows can dramatically improve application response time for small latency sensitive "Mouse" flows without impacting the throughput of the Elephants - see Marking large flows for additional background. Performance optimizing hybrid OpenFlow controller demonstrated how hybrid OpenFlow can be used to mark Elephant flows on a top of rack switch. However, building test networks with physical switches to test the controller with realistic topologies is expensive and time consuming. Mininet offers an attractive alternative, providing a lightweight network emulator that can be run in a virtual machine on a laptop and realistically simulate network topologies. In this example, Mininet will be used to emulate the four switch leaf and spine network shown in the diagram at the top of this article. While physical networks might have link speeds ranging from 1Gbit/s to 100Gbit/s, the emulation scales link speeds down to 10Mbit/s so that they can be emulated in software. Linux Traffic Control (tc) commands are used to emulate hardware priority queueing based on Differentiated Services Code Point (DSCP) class, mapping DSCP class 8 to a lower priority or "less than best effort" queue. In this example the sFlow-RT controller is running on host 10.0.0.162 - change the address to match your setup. The reported throughput of around the 10Mbit/s shows that the traffic is saturating the emulated 10Mbit/s links. 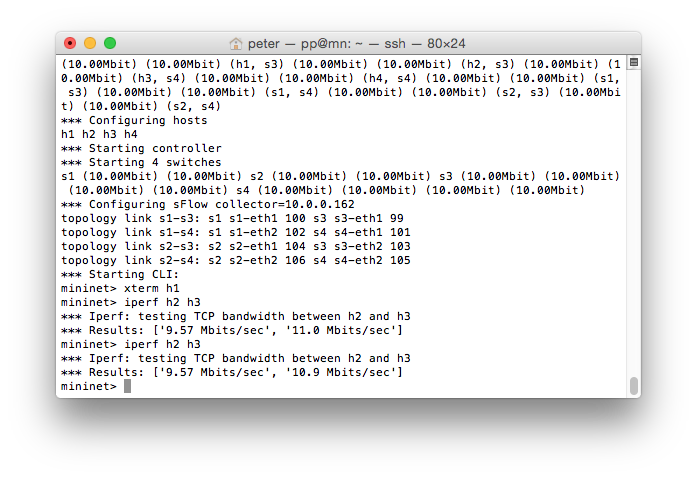 The following screen capture shows the ping results during the iperf test. 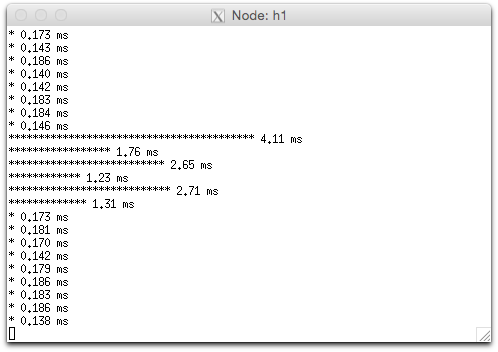 The ping test clearly shows the impact that the Elephant flow is having on response time. In addition, the increased response times of around 3ms are consistent with values shown in VMware / Cumulus Networks charts shown earlier. 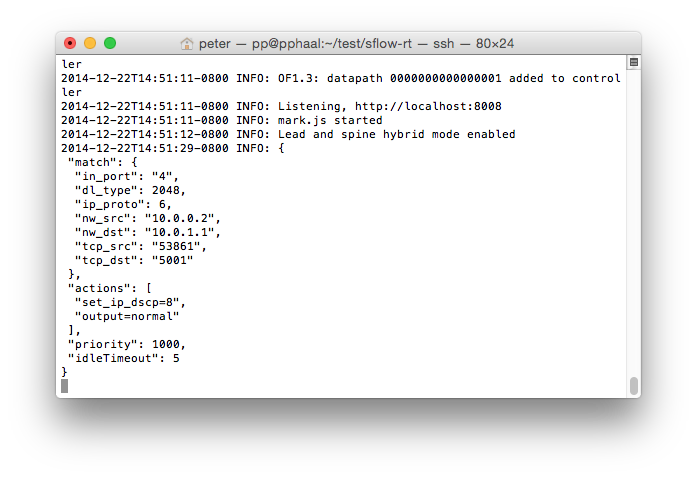 The included leafandspine-hybrid.js script emulates hybrid OpenFlow by rewriting the NORMAL OpenFlow action to jump to the table that contains the ECMP forwarding rules. 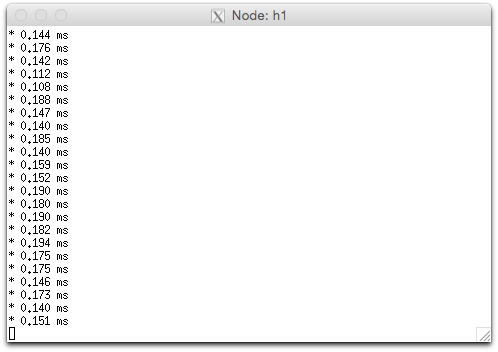 The script assumes that Mininet emulation is running on host 10.0.0.30. Modify the address in the setTopology() function for your setup. The setThreshold() function defines Elephant flows as TCP connections that exceed 10% of the link's bandwidth (in this case 1Mbit/second) for 1 second or more. The setEventHandler() function processes each Elephant flow notification and applies an OpenFlow marking rules to the ingress port on the edge switch where the traffic enters the fabric. The OpenFlow rules have an idleTimeout of 5 seconds, ensuring that they are automatically deleted by the switch when the flow ends. 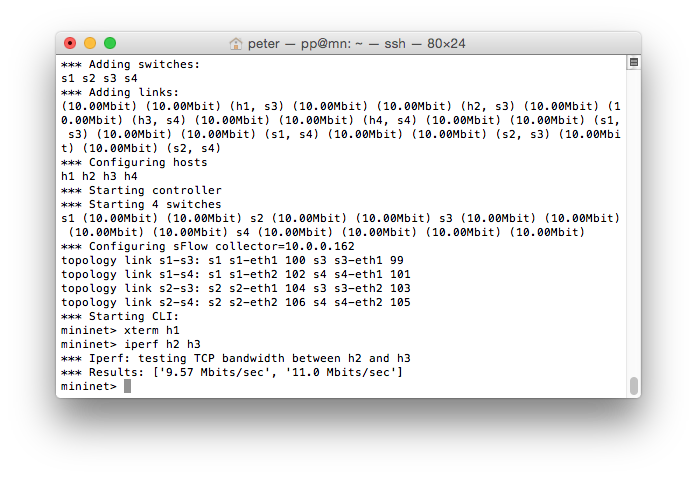 The iperf results show that throughput of large flows is unaffected by the controller. The screen capture shows the controller actions. The controller installs an OpenFlow rule as soon as the large flow is detected, settings the ip_dscp value to 8 and outputting the packets to the normal ECMP forwarding pipeline. The marked packets are treated as lower priority than the ping packets. Since the ping packets aren't stuck behind the deep queues caused by the iperf tests, the reported response times should be unaffected by the large flow. The ping test confirms that with the controller running, response times are unaffected by Elephant flows, an approximately 10 times improvement in response time that is consistent with the results shown for a physical switch in the VMware / Cumulus charts shown earlier. More broadly, hybrid OpenFlow provides an effective way to deliver SDN solutions in production, using OpenFlow to enhance the performance of existing networks. In addition to large flow marking, other cases described on this blog include: DDoS mitigation, enforcing black lists, ECMP load balancing, and packet brokers. Increasingly, vendors recognize the critical importance of hybrid OpenFlow in delivering practical SDN solutions - HP proposes hybrid OpenFlow discussion at Open Daylight design forum. The article Super NORMAL offers some suggestions for enhancing hybrid OpenFlow to address additional use cases, reduce operational complexity and increase reliability in production settings. 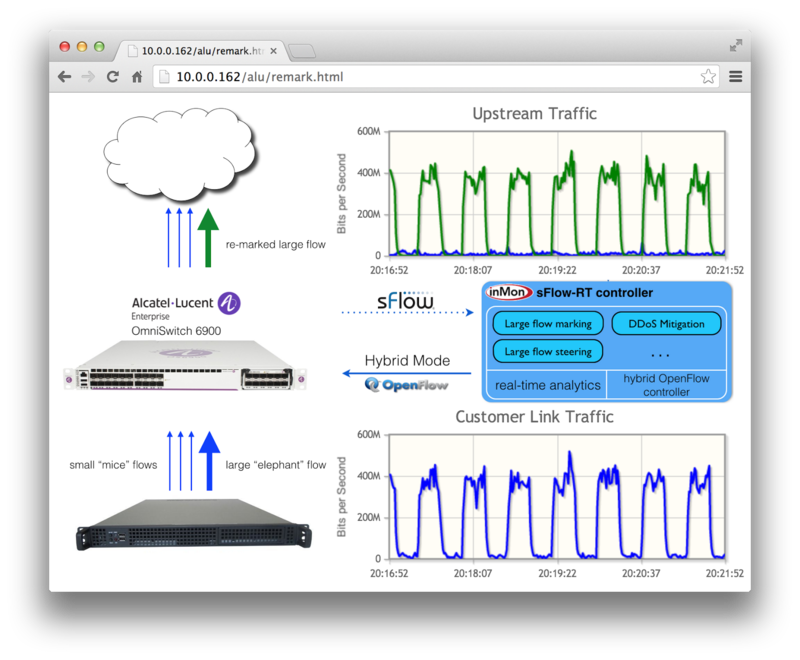 Finally, the sFlow measurement standard is critical to unlocking the full potential of hybrid OpenFlow. Support for sFlow is build into commodity switch hardware, providing cost effective visibility into traffic on production networks. The comprehensive real-time traffic analytics delivered by sFlow allows an SDN controller to effectively target actions, managing the limited hardware resources on the switches, to enhance network performance and security. I added to this script, getOfRule(dpid,id) in the next line of setOfRule. But I can not get any rules by calling http://localhost:8008/of/rule/0000000000000003/mark1/json although the large flow is marked. The rule has an idleTimeout of 5 seconds, causing the rule to be automatically removed by the switch within 5 seconds of the flow ending (and also automatically removed from sFlow-RT). Each subsequent Elephant flow rule has a different id mark2, mark3, ... making it difficult to read back rules via the REST API. I'd like to know that can Sflow analyzer be used as a application classifier for application aware engineering in SDN environment.Can it classify which flow is video, which flow is SSH or something like this.